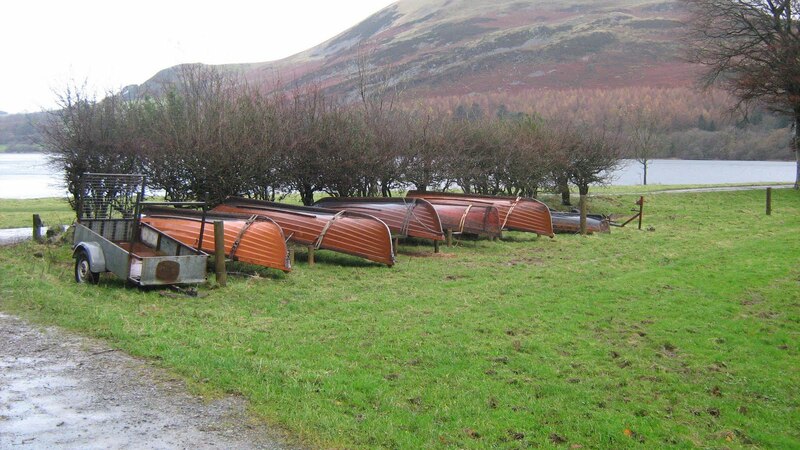 With winter closing in its time to bring the rowing boats away from their summer moorings and back to their winter homes. 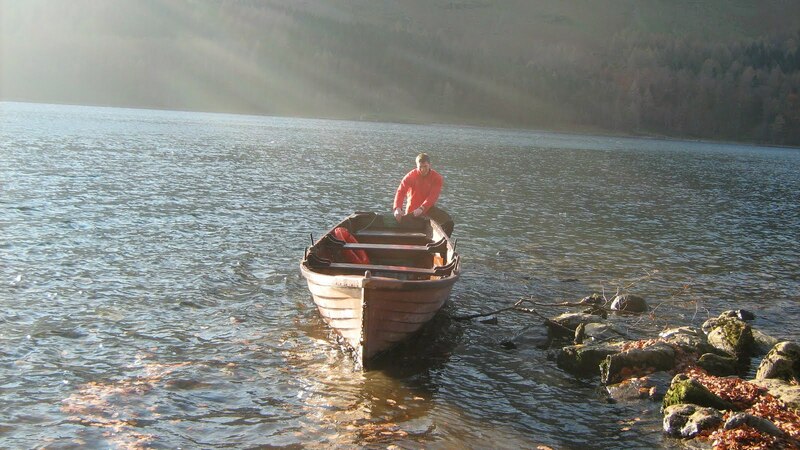 The boats weigh a considerable amount, so we had to call upon our Borrowdale counterparts (the driver is shown in the picture below) to help haul the boats off Crummock Water and Buttermere. 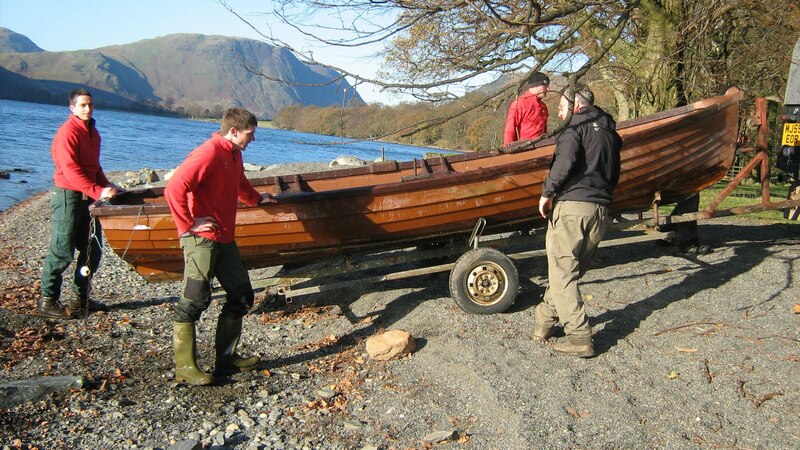 Getting the boats off Crummock was straight forward as we had the use of a quad bike and the boat stands are at the lakeside by the moorings. However removing the boats from Buttermere was a different story. straws to decide who was going to pull it round to where the boat trailer was situated. Unfortunately for Jack he had wellies on so we threw the short straw at him. It really was not Jack's day, whilst moving the boat the lake rose over his wellies. 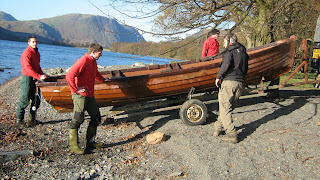 Nevertheless Jack got the boat round to the shore and we loaded it up onto the trailer. 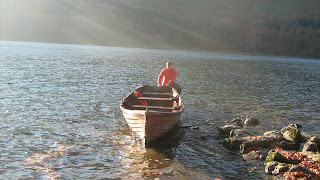 With the boat onboard and secured, we headed back to Loweswater where it will remain for the winter. The boats laid to rest for another year before returning to the waters next spring. These volunteers are easily pleached! It was Monday 14th November and the North Lakes hedgelaying season had to start with the hundreds of metres of hedges needing to be layed. We decided to start with a hedge at Dunthwaite because of the ease of access to the site and two volunteer days back to back later that week. Before the two volunteer days we needed to prepare to lay the hedge. This involved letting the tenant farmer know we were going to be working on his land, followed by removing the barb from the hedge and thinning out any unwanted stems ready for the hedge to be layed. 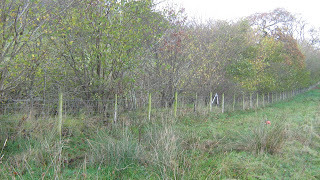 The following picture shows what the hedge looked like on our arrival to the site. 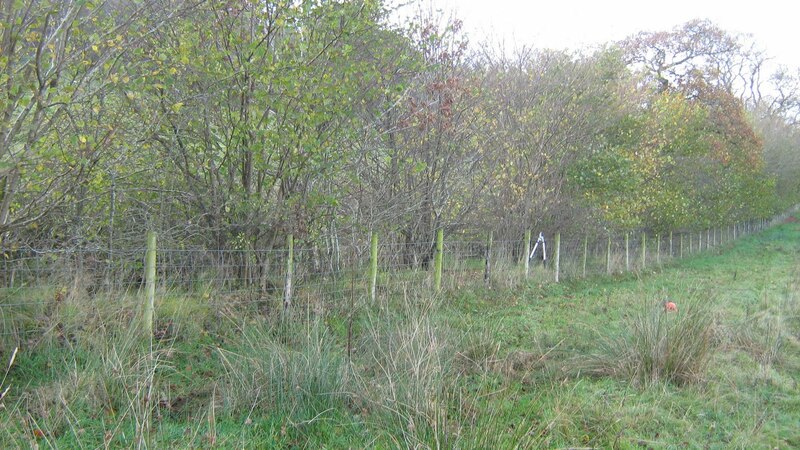 As can be seen from this picture (above) the hedge was made up of numerous small coppices mainly hazel, a scattering of hawthorn, blackthorn, willow and oak. 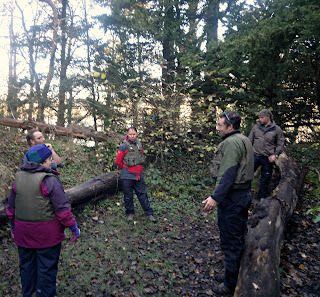 This is a picture of the first volunteer day consisting of six Fix the Fells volunteers. The volunteers were split into two hedgelaying teams and one team that were "Fire Guardians". Below is Martin and Ian laying a stem, Martin (in blue) is putting in the pleaching cut with a billhook and Ian is carefully positioning the stem in the correct place. The following day we returned to the hedge with our weekly volunteers to finish the 60m section and burn the remaining brash. 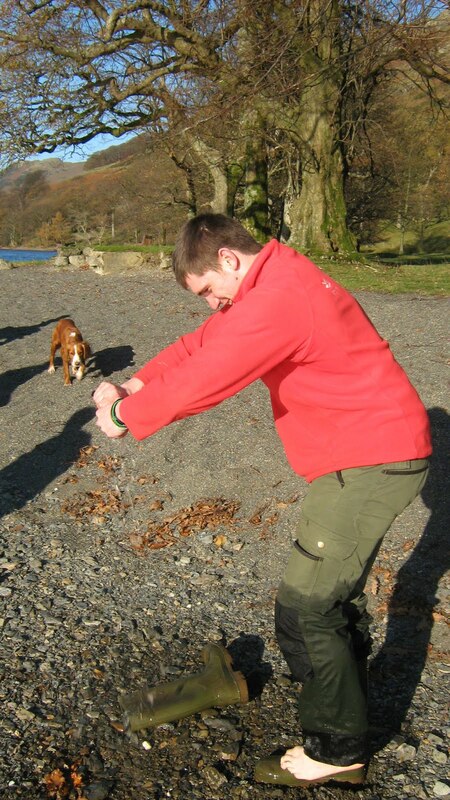 The final picture illustrates the 60m stretch layed in three days...off to a good start with the hedgelaying season thanks to the volunteers and the Borrowdale estate team. Today at the office I thought what the heck. A trip up Honister was in order to replace the water heck near the cattle grid. We had a helping hand from the Forestry team to take the 20ft pole and the monster which was the heck, on their Forwarder. Just looking at the heck in the work shop you would think there were Bison living up on Honister. The first stage was to get the Forwarder in to position so that it could get the old pole out, and then get the new pole in to position. When the pole was in position and secure it was time to get the heck in to position. We used two straps to hang it off the pole for a temporary measure.This helped us to make adjustments to the heck so that it will open properly and not get caught on the rocks that were in the beck. This also helped us to get our holes drilled in the pole for the pins to go through, and get our hangers in to position. Once it was all lined up and in the correct position, the straps were removed. A good days work with our volunteers up on Honister with the weather on our side for once. 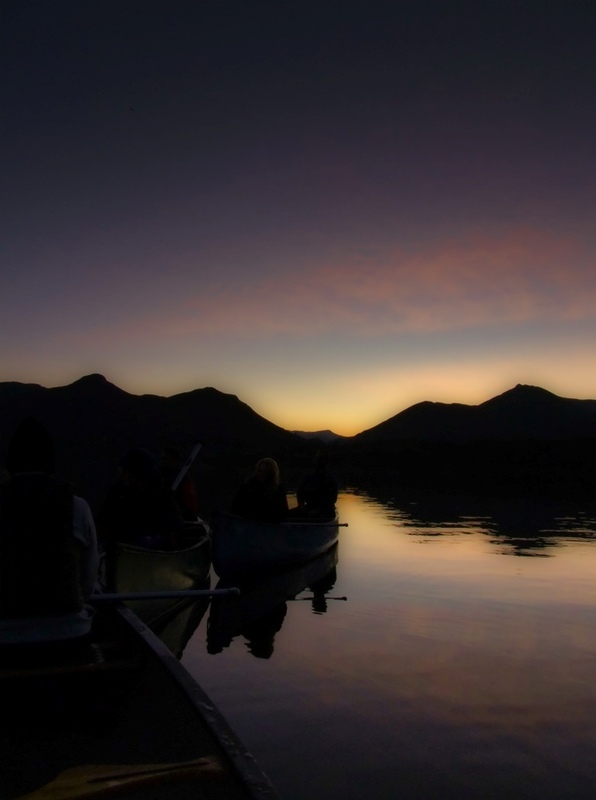 Sunday 6th November saw us joining our Derwentwater Foreshore Project on a fantastic canoe trip round the islands on Derwentwater, we were accompanied by Jamie Lund ,National Trust archaeologist along with Karl and Paul from the Keswick Canoe Company who supplied our boats and equipment and didn't laugh too much at our clumsy paddling techniques! ( I'm assured we got better as the day went on). 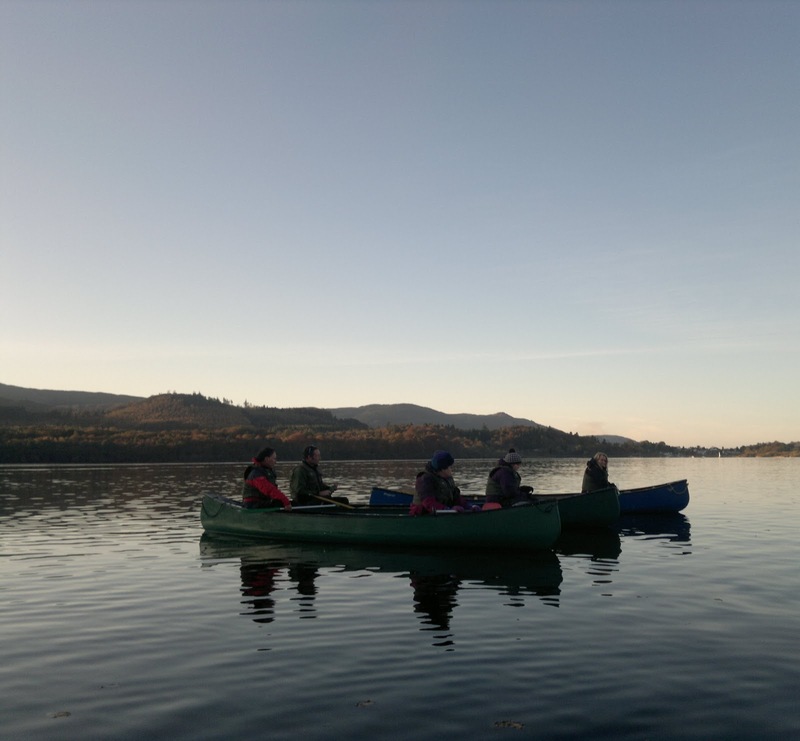 We set off from the foreshore, nine of us in five canoes and headed straight or as straight as we could manage for St Herbert's Island, the 7th century home of St Herbert. where Jamie showed us the site of the Chapel and told of how the island became a popular pilgrimage site in Medieval times. From there we paddled on for a short stop just off Rampsholme , 'the isle of wild garlic' the site of an ancient iron bloomery,a primitive iron smelting furnace,it was interesting to hear that the Wild Garlic which gives the island it's name is now becoming scarce due to large numbers of geese grazing the island, I wonder is there a market for garlic infused goose? Off we set again, a more dignified paddling style was developing by now, and we were soon beaching the canoes on Lord's Island, once Jamie had explained the history and showed us some maps it was fairly easy to imagine the manor house which stood on the island and is believed to have been dismantled around the time of the English Civil War . Our last island was the only inhabited one on the lake, Derwent island ,so landing was not possible.We allowed our canoes to drift slowly just off shore and whilst watching the sunset, heard all about the history of the island , it's use as a base for German miners in Elizabethan times and the exploits of Joseph Pocklington who bought the island around 1778 for £300 and set about building the house and many follies around the island including a porter’s lodge, a fort, a Gothic chapel-boathouse, as well as a standing stone and ‘druids circle’. As darkness closed in we paddled quietly back to the foreshore enjoying the final stretch of a wonderful couple of hours, I can't think of a finer way to spend a Sunday afternoon and look forward to next time. Our Forestry team are just as good!